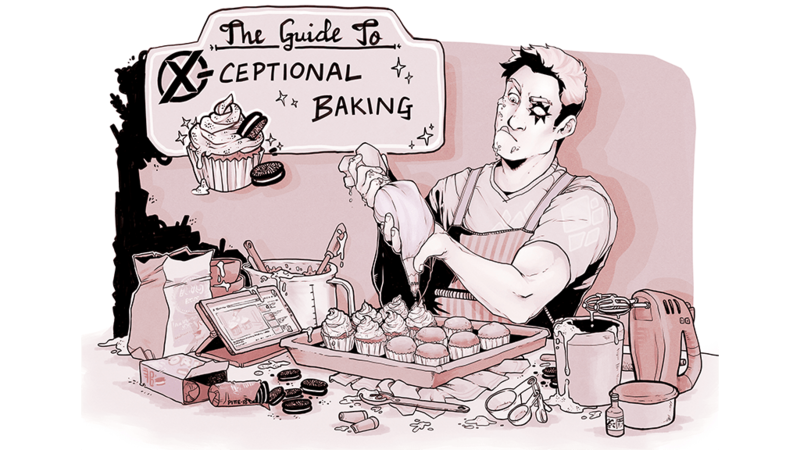 Recipe for Kickstarter success: A look inside 'The Guide to X-Ceptional Baking,' an X-Men-themed cookbook – AiPT! Charlie and Mikey, co-hosts of “The Young Ones” podcast, dish on their fully funded X-Men cookbook, “The Guide to X-Ceptional Baking”! Since their debut in 1963, the X-Men have sworn to protect a world that hates and fears them. But you know what? Here at AiPT!, we’ve got nothing but love for Marvel’s mighty mutants! To celebrate the long-awaited return of Uncanny X-Men, AiPT! Brings you UNCANNY X-MONTH: 30 days of original X-Men content. Hope you survive the experience… Are you an X-Men fan? Do you like zines? Do you like to bake? If you answered “Yes” to any of these questions, you need to check out The Guide to X-Ceptional Baking, a zine funded through Kickstarter from the minds of Charlie and Mikey, co-hosts of The Young Ones podcast. The long list of contributors throwing their art, recipes and writing into this zine include Adam Reck and Zack Jenkins, co-hosts of the Battle of the Atom podcast, Jay Edidin of Jay and Miles X-Plain the X-Men and many more. Charlie and Mikey were kind enough to answer a few questions about the inception of the zine, their experiences making it and Shatterstar’s preferred soda flavors. AiPT! : First of all, congratulations on your Kickstarter being funded! Did you anticipate the project finding such speedy success? Charlie: Thank you so much! I don’t think we really had any idea that it would fund so quickly. Mikey and I did a lot of research on Kickstarter projects, especially ones that that involved cookbooks and weren’t just art books, but you never really know what the demand is for something like this. All the fandom-related projects we looked into it had seemed to do well and I think we were just hoping that this would take off too. Nothing like the way it did, though. Mikey: Yeah, we did our research and had pretty good expectations for our campaign, but the response completely blew me away. AiPT! : For readers who don’t know you both, tell us a bit about your connection to X-Men and comics! Charlie: For me, I got into comics pretty late in the game. I always loved the idea of the X-Men, but I think that comics scared me a lot when I was younger, at least in regard to how to start getting into reading them. My entry in was when I watched X-Men: First Class. I loved that movie a lot and it got me excited about diving head first into the comics. Little did I know that the XMCU isn’t exactly the X-Men you see in the comics. I started reading X-Men when [Brian Michael] Bendis started his run by bringing back the teenage O5. I loved those books and still do because they were my jumping on point, but as anyone that knows me now can tell you, as I started digging into the older comics I found a lot to love about the weird X-Men. They hit that sweet spot for me. I love the weird X-kids like Eye Boy and C-listers like Rictor and Shatterstar who are my favorite X-Men. It’s why ’90s X-Force is probably my favorite comics run of all time. Mikey: I’ve always been a fan of superheroes–my dad had me watching Adam West’s Batman when I was three–but growing up, comics weren’t really something that were accessible to me in any way. That all changed when I started reading comics in college, since I had my own money. I started with Young Avengers and Runaways, and had some friends online that were into the New Mutants as well. Young Avengers got me into the Maximoffs, Magneto and mutants, in general, and I think Schism was the point at which that love was really cemented since it was a good jumping-on point for me. Like Charlie, I also love how deep the X-Men run; there’s basically a character for everyone to love. And that’s something we really wanted to show off in this book as well, or show sides of characters you don’t often see. AiPT! : Walk us through the origin story of the zine. Why a baking recipe book? Charlie: My ideas pretty much just spring up out of nowhere. I’ve always loved to bake and cookbooks and their design aesthetics have always been a niche interest of mine. I had been talking with some friends of mine about doing a zine and suddenly this idea, much like the idea for our podcast, just came to me. I kind of figured why the hell not? The X-Men are like one big family that spends so much time together, why wouldn’t they bake? Mikey: When Charlie came up with the idea, I knew we had something special–fan cookbooks on Kickstarter cover a pretty wide range, but there was nothing that was really focused on the art and stories of the recipes from an in-fiction perspective. We hoped by bringing in art and writing, core pillars of comics, that we’d create something that’s both a fitting tribute to the medium and to the X-Men themselves. Some of my favorite parts of X-Men, especially, is that they’re allowed to have these hugely personal stories, and they’re all about found family, so I think more than any other group, they’re people you can imagine sitting down and baking together. So I think that was a huge part of it. AiPT! : What was it like collaborating with so many artists, creators and recipe writers? Were you initially worried about finding contributors? Charlie: It’s been awesome, actually! Over the years I’ve gotten to know some amazing artists and I’m lucky enough to call a lot of them friends. Though It wasn’t until I was putting the book together that I realized just how many talented people I knew might want to participate. The outpouring of interest when I put the call out for submissions was tremendous. Everyone has just been amazing to work with and it’s been really special getting to see people share family recipes for the book. Also, no one is ready for the caliber of art that’s in this book. Like… really. AiPT! : What was the biggest challenge or learning experience from the project so far? Mikey: For me, it was probably learning what feels like every Adobe product ever. I do a lot of personal graphic design work in Photoshop, and I’d dabbled briefly in InDesign for some of my work designing tabletop roleplaying games, but nothing past basic layout. For this project, though, I literally broke out the book and went through a crash course on layout, typography, all that good stuff, building on the basic principles I already knew by eye. And then for the Kickstarter video, I had to learn After Effects, which was actually way easier than I anticipated, but still quite a bit of work in total. When we were preparing all the assets for launch, my After Effects crashed my entire computer, so I went to sleep, and eight hours later, everything worked fine. Charlie and I are pretty good about doing our research ahead of time and knowing our limits though. Overall, I’d say getting this going has actually maybe been a little easier than getting the podcast ball rolling and dealing with the technical side of that. AiPT! : Any favorite recipes we can get a sneak peek of? Mikey: One of my favorites is actually on the Kickstarter page itself in our layout preview, for Rum Cake. It was one of the first recipes we received and Zack Jenkins of Xavier Files absolutely knocked it out of the park. Charlie got the email and called me like, “You need to read this recipe.” So I did a dramatic reading over the phone and we just sat cracking up for a while afterwards. We also are lucky enough to have not one, but two recipes from the amazing Jay Edidin. Jay pitched us this second recipe after submitting his first. It’s for beer bread as this thing the adult X-Men bake right before the kids come back to school at the beginning of the semester, and it’s got a great little story that goes along with it. There’s more, but like a good solicit, I don’t want to give too much away ahead of time! AiPT! : This one is high key inspired by the most recent episode of The Young Ones: What do you think Shatterstar’s favorite flavor of Mountain Dew is? Charlie: Funny you should ask. I had an immediate answer for this one, but after deliberating I had to change it. Initially, I thought it would be Code Red because of how much sweeter it is than regular Mountain Dew, but I’m going to have to go with the late great Pitch Black. ‘Star would love the name of it and the fact that its basically just grape pop. Also, he would be super frustrated that it’s almost never at the store, but he’d ask someone to look for it every time that they went shopping anyway. AiPT! : Finally, where can people keep up with you both and find your work? Charlie: You can mostly find me on Twitter @geneticghost where I tweet about all manner of things, but mostly X-Men. I’ve been reviewing and writing articles for Women Write About Comics and you can find my coverage about Extermination over there when it comes out monthly. As always, you can find my and Mikey’s podcast, The Young Ones, which is all about teen superheroes and why we love them at youngonescast.com. Mikey: And you can find me on Twitter @quantumdotdot. In addition to talking about the comics that I’m reading, I tweet about video games and tabletop roleplaying games. My big tabletop project I’m working on is my surreal horror/mystery game based on the Blades in the Dark system, called “No Place Like Home.” All my work, including a link to my Twitch channel where I stream games, can be found at quantumdot.space. While The Guide to X-Ceptional Baking is funded, two stretch goals have been added. To pitch in or just find out more, visit the zine’s Kickstarter page. But hurry–the window to back this project ends Wednesday, November 7!